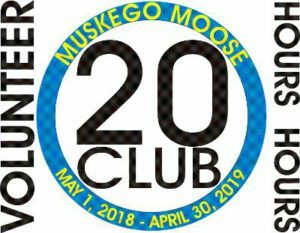 Are you a member of the 20-Club?? Prepare to be pampered, you deserve it! 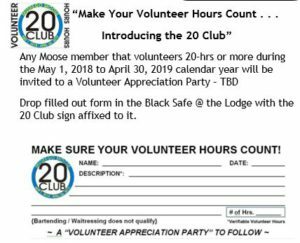 A list of qualified Volunteers will be posted at the Lodge. 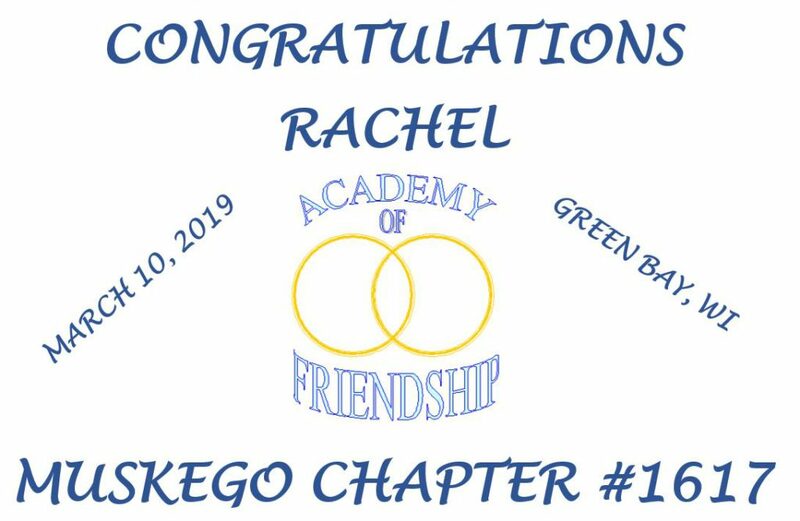 Please check off your name or RSVP asap so we can plan accordingly. 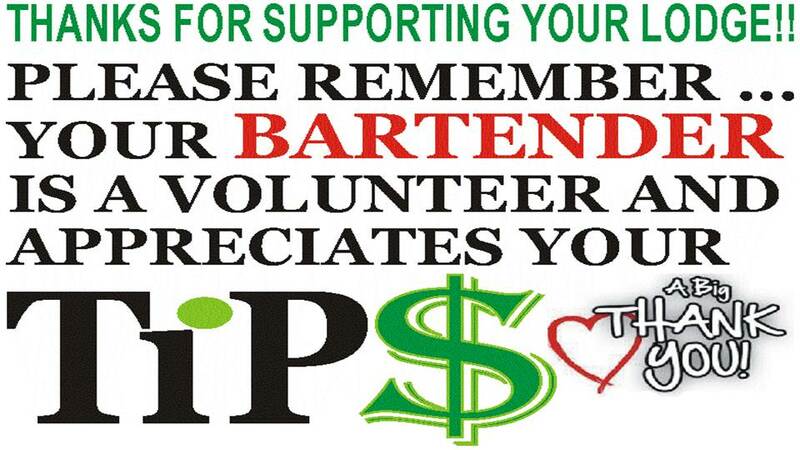 Thank you all for everything you do!! April’s Dinner Specials Wednesday through Saturday! 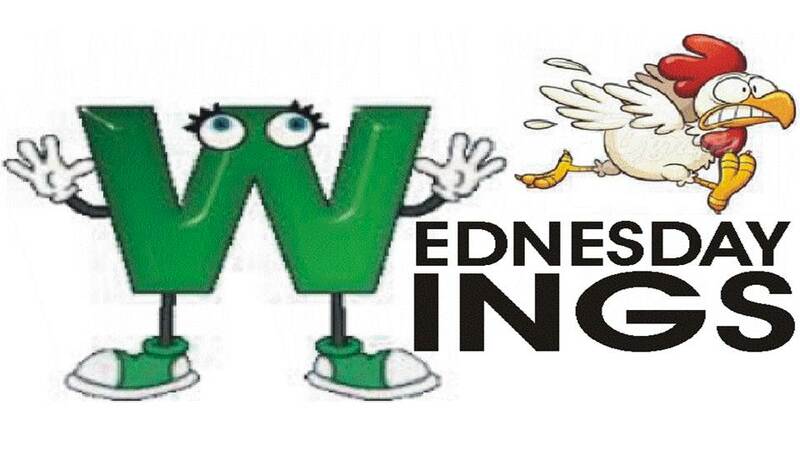 Wednesday – ALL NEW!! Build Your Own Burger Bar – 1/3 lb all beef patty with or without cheese – $5. Add fries for just $1 more. 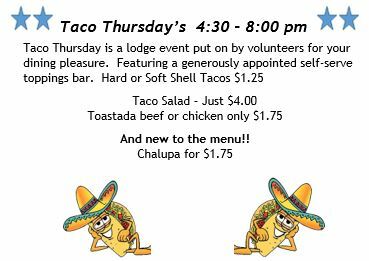 Thursday – Mexican Night! – Enjoy Tacos, Taco Salads, Quesadillas, Chalupas, Nachos and much More! Don’t forget the Margarita! Saturday – Build your own Pizza Night! – Enjoy a pizza for just $10 and get a $5 pitch of domestic beer! Look who’s Celebrating a Birthday in April! 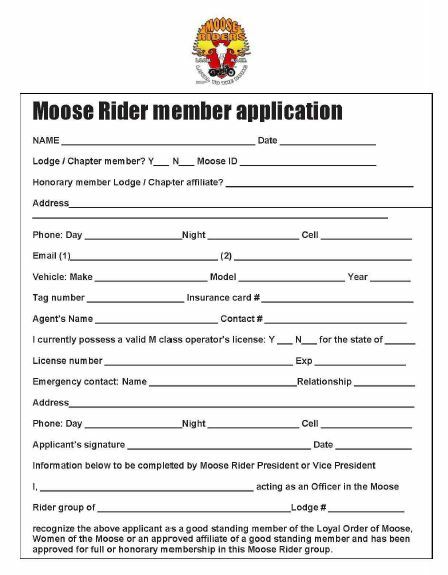 MOOSE RIDERS MEMBERSHIP DUES ARE DUE APRIL 1ST PLEASE SUBMIT APPLICATION & FEES. 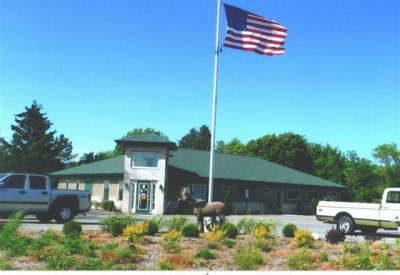 The Lodge has purchased & installed a Member Card Reader that is located at the front door. You will need to swipe your Membership Card to gain access to the Social Quarters. Let’s make sure your card is current, by renewing your membership prior to the expiration date. 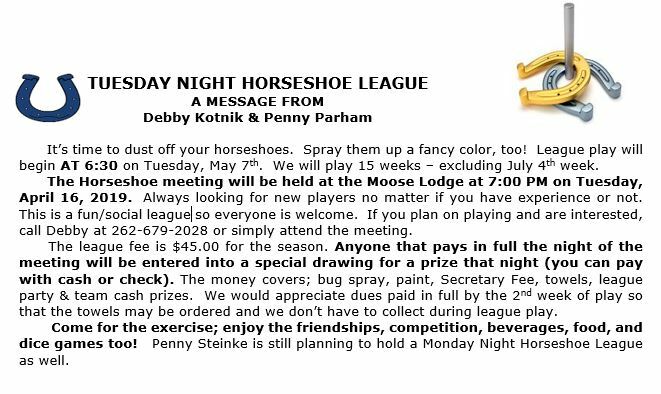 IMPORTANT NOTICE: The Loyal Order of Moose is a private organization. 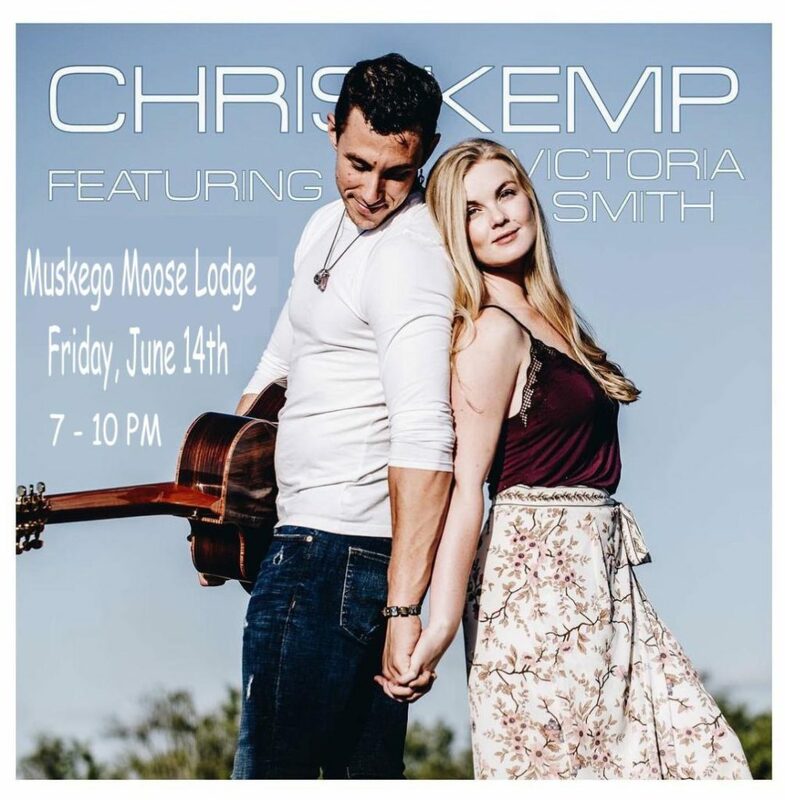 All activities and events referred to on this Website and in the Moose newsletter are available to active members and their qualified guests only. This website is for informational purposes with proprietary information intended for members only. General information is available to the public at large, but should not be construed to be a solicitation for membership. 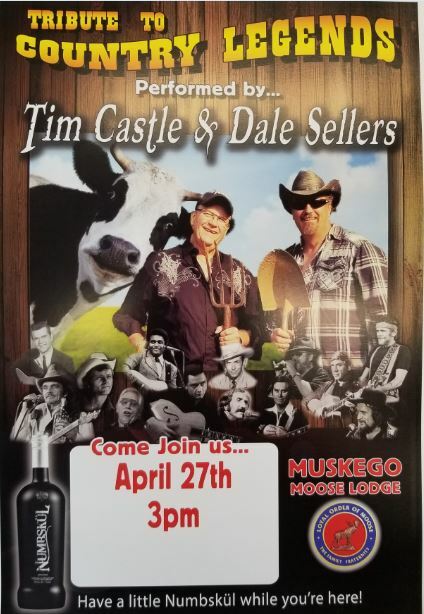 This website is an initiative of Muskego Moose Lodge No. 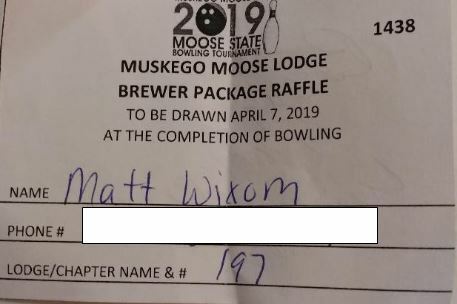 1057, and is not sanctioned by the Loyal Order of Moose, Moose International or any subsidiary hereof. 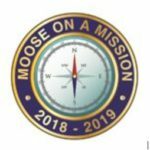 All logos, trademarks and servicemarks pertaining to the Loyal Order of Moose and/or its programs or degrees are copyrighted © by Moose International, Inc., Mooseheart, Illinois.